Pie – SPAK will snack. IT’S NATIONAL PIE DAY AND NATIONAL EAT A RED APPLE DAY! Pie Day, PI DAY, was on March 14th. It’s not okay to claim this false idol. But we’ve come around to it, being that we don’t mind being asked to eat pie multiple times within a week (see Bavarian Cream and Lemon Cream in the last 4 days), let alone within a year. To give ourselves a bit of variety from the pies we’ve had recently, we got these little miniature pies from Target. Anyway, Eat a Red Apple Day was easy. There’s one of these in SP‘s lunch every day of the year! Thank goodness for apples that can survive winter. Tomorrow is National Fritters Day! IT’S NATIONAL LEMON CREAM PIE DAY! We can’t keep eating pie all week. We have to temper ourselves a little bit. So we bought this thing that says Lemon Cream Pie on it. Citrusy desserts aren’t always the best, but this was a pretty good treat. Tomorrow is National Mousse Day! TODAY IS NATIONAL BAVARIAN CREAM PIE DAY! We had some experience with a faux bavarian cream, but we wanted a serious undertaking today. Real bavarian cream is a custard, frequently thickened with gelatin. The regular serving of it is to mold it into a frustum shape and served on its own. But once the Americans get their hands on anything… well, then it just becomes another pastry cream to fill stuff with. Like a pie! We grabbed a recipe from AllRecipes and got to work. Mix up the sugar, cornstarch, and egg in a mixing bowl. AK got inventive to do this double-boiler system. Big pot has hot water, top pot has the custard mixture. Take out the custard pot to let it cool, but mix in 3/4 cup of ice cream while it’s still hot. Whip up a bunch of whipped cream. Use about 3/4 of the whipped cream to fold in to the pie, saving the rest for the top of the pie. The pie, before we let it set. Topped with the rest of the whipped cream. It mostly tasted like cream. Next time maybe we’ll add more vanilla or almond flavor just to see what happens. This is only the beginning of a tri-pie week when we have National Lemon Creme Pie Day on Tuesday and National Pie Day (wrong) on Thursday. But in the meantime, tomorrow is National French Toast Day! TODAY IS NATIONAL BOSTON CREAM PIE DAY! History lesson: like many other early American desserts, there is some disagreement about who invented what food. Perhaps it was an Armenian-French chef, M. Sanzian, who created it for the Parker House Hotel in 1856. Maybe it was conceived of for a cook book in 1878. But the general agreement is that the modern variant, spongey cake with cream filling and a chocolate coat, was first chronicled in 1887, though it was called Chocolate Cream Pie. It’s not even a pie. It’s a cake. I guess people in the 1800s just didn’t have their lives together. 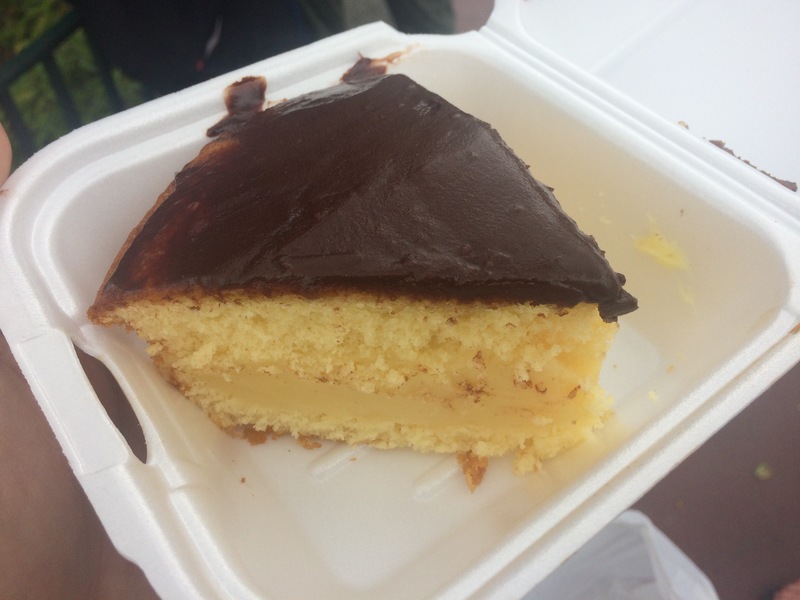 In 1996, Boston Cream Pie was declared the official dessert of Massachusetts. And now we celebrate its National day! Best part was being able to share it with our field trip buddies! We’ll try it this way… AKron, AKaul, AKamy, AKali, and AKio. That was tough. Sorry guys. TODAY IS NATIONAL STRAWBERRY CREAM PIE DAY AND NATIONAL DRINK BEER DAY! Today we celebrated by having this Sioux City Birch Beer. It’s not beer in the traditional sense, but it sure is in the title! Well if beer isn’t your thing, maybe dessert is? SP‘s “contact” at Baker’s Square says that currently Strawberry Cream Pies are out because strawberries are “out of season.” This is coming from the same place that serves strawberry-rhubarb pie to octogenarians year-long. Trips to the grocery stores nearby were not fruitful (or creamful) either. So we had to make it at home! AK mixed up some strawberry Jell-O and some vanilla pudding, and made this little pie-lets. Top with strawberry and cream and there you have it. That’s right! IT’S NATIONAL WAFFLE DAY AND NATIONAL PEACH PIE DAY! Pearls is one of SP‘s favorite comics, so he was delighted to get this comic via e-mail from SPom this morning. Waffles are great and they do deserve their own day. Not specific waffle types, but just waffles in general. Whether you eat Eggos on the run or you take the time to go somewhere tasty like Black Coffee & Waffle Bar, today is a day to sit back and enjoy the syrupy, battery goodness that is the waffle. SP bought this waffle maker for AK as a present. The mix is 2 cups of Kodiak mix and 2 cups of water. Easy peasy. It was dark when we took this picture because AK can’t handle bright lights in the morning. As we found out the other day, peaches are in season! And of course that means peachy desserts. No, not Melba or Cobbler. Straight up pie. Tomorrow is National Banana Split Day and National Whiskey Sour Day!